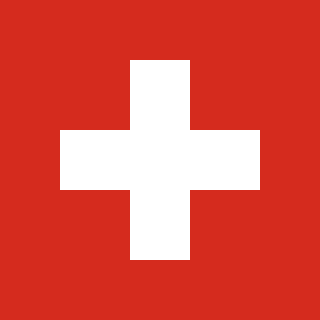 Switzerland selects its entry for Copenhagen this weekend. The line-up consists of six songs, most of which are very typical Swiss eurovision entries. And that is unfortunately not a compliment. The Swiss often go for very inoffensive little songs, sung by polite performers who are all very careful as not to upset or disturb anyone. That's how you get forgotten really easily. So I am about to give the Swiss a piece of advice I never thought I would give a number of weeks ago, when I heard the songs for the first time. When I first heard Together Forever by 3 For All, I couldn't believe my ears. It was so stupidly cheerful and aggressively optimistic and happy that I lost my breath and decided I never wanted to hear it again. And then it kept playing in my head. And when I listened to it again, it is still stupidly cheerful and aggressively optimistic but also catchy. And a bit tongue in cheek. And a bit funny. Atrocious but efficient. If the group can keep the same approach on stage and not be too serious about their "save-the-world"-lyrics, this could be quite a fun little number in Copenhagen. PS! If you select Yasmina Hunzinger with her well-sung but dull-as-dishwater ballad, you are toast. 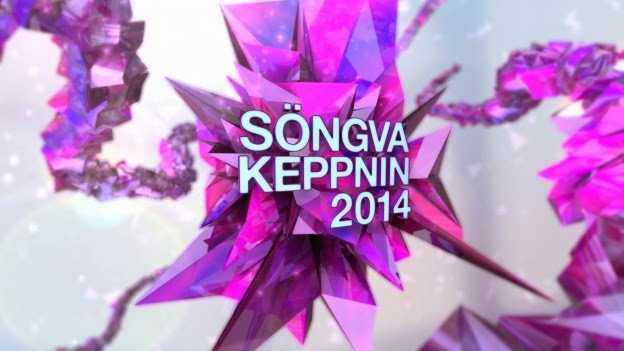 As Sweden's melodifestivalen kicks off, Finland's UMK culminates with a big final at the Barona Areena in Espoo. The four judges and the Finnish televoters will select the winning song that will hopefully make a splash in Copenhagen. Not that UMK seems to care too much about that ESC final. They would much prefer being an important and credible song contest in their own right and Eurovision is seldom pointed out as any particularly important reference point during these shows. If this show is a talent search, then it is doing really well. Quite a few of these participants could do well in the future if they play their cards well. But as a eurovision selection show, the whole thing has unfortunately stalled a bit since last year. There are still good songs in the running, but in Eurovision you need a perfect package that reaches out to the audience at once. You only have three minutes to impress and most of these songs are not designed to do that. Here are the eight songs with my new grades - this ones reflect how good a choice I think the song in question would be for Copenhagen. A good song, splendidly sung by a brilliant and charismatic lead singer. The band desperately need choreography, though. Running around aimlessly in the background might be cool if you are in a local talent show, but it won't do at eurovision. If the performance can be tightened and strengthened, this could very well be Finland's best shot at a spot in the final come May. Puzzling that it was placed first in the running order - hardly the best slot you could have. It is even more puzzling that the winner of the second heat is placed in the dreaded number two slot. Not that I mind an awful lot. I never saw the appeal of this song. Hanna has a good voice but is wailing for too much, the breakdancer is just distracting and the songwriting is far too weak. My jaw dropped when this song won its heat. Knowing how unpredictable Finland can be, I hope my jaw will stay in place once the results are in. An interesting group that has very little to work with. The song never takes off and becomes annoying long before three minutes are over. They would deserve a much better fate than this. Clearly the best vocal delivery out of the eight acts in the final. In the ESC, it would perhaps have made more sense to have a more positive entry that would still let Lauri's vocal chords work. Something slightly snappier, slightly catchier. And the backing group could be a bit more animated too. A reasonable but risky choice for Copenhagen. And very unlikely to happen. The seemingly compulsory punk act. No Finnish final is complete without it, it seems. Catchy but slightly dated and really unoriginal. Is this our winner? Mikko's entry sounds very familiar for a Finnish audience, his song would suit the radio stations perfectly and he signed up with Warner - a major label in Finland, who have been really good at making their acts win this contest. I would not be surprised if the jurors also had a change of heart and favoured Mikko over Hanna Sky this time around. This seemed to be bound for a good placing until Clarissa's vocals proved to be a bit on the wobbly side. Perhaps - if they nail all the hard parts and the performance is improved and better suited for television - this could emerge as a surprise winner. But Germany's flop in Malmö last year might be a hint that generic dance pop is not what Europe is craving at the moment. An equally puzzling end to the presentation - who was in charge of sequencing this running order? Hukka ja Mama are intriguing, different and have a sound of their own. Bosnia-Herzegovina used to get away with this kind of thing. Another risky choice that could pay off, but is the song distinct enough to appeal to an international audience? I wouldn't be too sure. The winner will be Softengine or Mikko Pohjola. Softengine has a youthful appearance and a graspable song with a good handle. It will need some improving still before Copenhagen but is still a credible choice. Mikko on the other hand has the best song in the running, but has had difficulties delivering it as breezily and relaxed as it would need to be. If he has problems relaxing on stage now, what will he be like in the big ESC final? If I have to select one I say it will be Mikko but I hope for Softengine. With a bit of luck, either one of them can make it through the semi. If not, the UMK people might have to take a long hard look in their mirrors and ask themselves what to do for next year. It is arguably the national final of all national finals, the Queen Bee of Eurovision selections. Most countries could never dream of putting the effort into selecting their eurovision entry that SVT does every year. 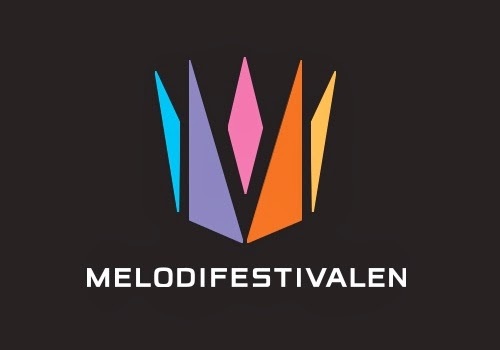 From now and for the next six weeks, melodifestivalen will completely dominate the Swedish showbiz and the ratings of all other shows up against it will sink like stones in the oceans. After a relatively lean 2013, it seems everyone really wants melfest to be back with a bang and most reviewers on location in Malmö seem to think it is. An old version of the MF logo. It doesn't look like this anymore, kids. Last year, I decided not to watch any clips or hear any sound bites in advance, preferring to wait for the live broadcast for a first impression. After seeing the minute-long snippets of all songs available on the melodifestivalen website, I think I might revert to the same tactics as last year. These snippets really show very little. It is very early rehearsals, singers don't give it their all, focusing way more on getting used to the stage and the cameras. These short selections usually let the songs down as well. I hope the eight songs will be better than these clips suggest. I'd like to think Helena Paparizou is bound for the final, but you never know. Had Sarah Dawn Finer sung that same song it would have Copenhagen written all over it, but the question is if Sweden really loves Helena enough to pay attention to her. I hope they do. Otherwise there is always a surprisingly anonymous Yohio, the return of the dated Swedish dansband schlager and an emotional song in Swedish delivered by a very tattooed young man. As for myself, I hope Alvaro Estrella's dirty little pop number will grow on me when I see it in full. France will select its candidate for Copenhagen in an open selection - meaning this is the first time the French public is involved in the selection since 2007. The selection is not the most ambitious project ever produced, but three acts were chosen to perform one song each on Natasha St-Pier's "Les chansons d'abord" tv-show and now people will have a whole month to vote for their favourite. It has been sixteen years since I lived in France. Already then, every French boyband in existence sounded exactly like this and already then, they loved singing half the lyrics in French, half in English. This entry brings nothing new to the formula and although the boys sing well and are more than capable of carrying a tune, the tune in question never develops or comes to any kind of climax. Pleasant but forgettable. The second song is also an old-fashioned ballad that could have been an entry in a Belgian or Swiss national final already in the early 90's. It builds a lot better than the first song but Joanna gave a nervous performance and seemed not to be in complete control of her vocals. That does perhaps not bode too well for her chances in a big international event. By far the quirkiest and catchiest of the three songs in the running and sending a memorable entry is never a bad idea. Just too bad that the verse bears a stronger resemblance to Stromae's "Papaoutai" than what is really suitable (and in my head, the chorus echoes this classic track by Jordy). You should always be careful how much you can allow yourself to borrow from others, but I guess this is nothing that a quick re-write could not fix. So who should win, then? The big female ballad always seems to be a strong contender in any national final, but the only one I deem worthy of sending off to any kind of competition is Twin Twin who at least have the oddball factor. Regardless, I doubt very much that Eurovision 2015 will be held anywhere near Paris. RÚV released the five songs taking part in the first of two semifinals leading up to this year's edition of Söngvakeppnin - the Icelandic national final for Eurovision - and of course I needed to check them out. Iceland has always been very close to my heart in this contest, and one of my oldest dreams is to see Iceland win and host the ESC - not least when they have been quirky, unpredictable and modern. Lately, however, the Icelandic entries have above all been nice. Pleasant. Unproblematic. Sweet and likeable enough to make it to the final but far too unspectacular to collect any larger sum of points in the end. The first five songs stick pretty close to this formula. Perhaps the ghost of Yohanna's successful but über-sweet song from 2009 still hangs over the local songwriters, but these songs show no interest in challenging their audience. There is no risk anyone will feel disturbed or offended by this lot. There is a sweet and pretty ballad sung by a male tenor, there are two girls with soft and slightly quirky up-tempo numbers, and there are two men with likeable but slightly old-fashioned songs. "Dönsum burtu blús"so much so that I almost expect Sigga and Sissa from Heart 2 Heart to come dancing out doing the twist in the background. There is nothing wrong with being nice. I just happen to know that Iceland could be much more interesting than this. Maybe there will be something unexpected that pushes the limits in the second semi instead of just being nice. I do like it when established names show up at Eurovision. They bring attention and a press following and a natural spotlight they can also share with some of the less known contenders. I for one think the presence of some established acts is vital to the contest. But a big name alone is not enough, just like Switzerland proved in 1985. There was quite a bit of enthusiasm when the news broke that Anita Kerr had composed the Swiss entry for Gothenburg. Anita Kerr was the leader and arranger behind the legendary Anita Kerr Singers, she had written books and had received a Grammy Award and was - arguably - one of the most influential women in the history of showbiz. She also became the third - and last - woman to conduct an entry at the Eurovision Song Contest. Just too bad that the song wasn't all too special. Not bad but not breathtaking enough to be composed by a living legend. A competent little schlager - surely not the worst Switzerland ever took to Eurovision - and an ode to a Swiss German kind of love where you keep a lid on your emotions and passions in order not to let them get in the way of your rational lifestyle. Pino and Mariella perform it well and the last chorus, where they intertwine the chorus with the verse, is pretty elegant. I always liked it, but it is far from being that everlasting evergreen many people seem to have expected. Singing on television is not an easy job. You can sometimes be lead to believe it is easy since some people make it look easy, but if you are a newcomer you could really do with some good advice from somebody who knows. Perhaps I would have a few objections to their styling - particularly that hood covering Josh's head for far too long - but that is less important here. Easy to fix, a light makeover could take care of that. There are much bigger problems here. It is hard to sing and dance at the same time. Clarissa is moving quite a lot on stage - especially before Josh comes in - and it clearly affects her vocal abilities. Better to stand still and let the camera-work create the movement instead. There must be chemistry. If you sing a duet, the audience wants to believe you have something going on between you. Standing very far apart throughout the entire performance is not a good way of achieving this. It also looks ugly. The cameras can never catch both of you in the same frame without using a very wide shot of the entire stage. For television viewers, you will look like strangers dancing on your own. It takes two minutes before we get the first image of Clarissa and Josh standing together and it is a very short one. Too little, too late. You must always be aware when the camera is on you. At 2:28, Clarissa gets a close-up at the same time as she starts jumping up and down, seemingly spontaneously. Had she instead sung straight at the camera, she would reach out much better to the viewers at home. When you are singing at a concert it is important to focus on the people seated in front of you and try to convince them of your greatness. When you sing on television, it is so much more important to focus on the cameras. You sing for the people at home - the people in the hall are a special effect and not your prime target. If Clarissa and Josh make it to the final - which I hope and think they will - I hope they will throw their present stage presentation out the window and start over from scratch. Find a choreographer who understands television, cut down on the dancing, stay closer to each other - so that the cameras can deliver many tight and pretty shots of the two of you together - and make sure you are always aware of where the cameras are. You don't have to look into them all the time, but you must be aware of them. After two elimination heats - where a grand total of two songs have actually been eliminated - Finland is about to go all wild and crazy and eliminate two more songs in order to cut the number of finalists down to eight. Two acts already made it to the final - Softengine and Hanny Sky - and it would be a surprise then if another entry would emerge as the winner in the end. But I've been around. Surprises are what this contest is made of. What about tonight, then? Eight entries that we've already seen and heard. Had it been the other way around - eight songs of which only two made it to the final - then there would have been a lot more to play for and a lot more nerve and excitement. The question is how much the Finnish audience will care about tonight's heat at all. If the number of viewers and votes are low, then the results could be all over the place. Apart from the very colourful outfit worn by the lead singer, this was pretty much like I had expected it to be: a complete copy of what almost every band sounding like this ever looked like. Good voice and good energy, but not a new idea in sight. Unlike many of the other acts in the running, this duo has a very distinct visual concept and have made a bit of an effort to make the viewers remember them. Breaking out of the crowd both visually and musically is never a bad idea - Hukka ja Mama should feel pretty safe tonight. Unlike the judges, I was impressed with Lauri Mikkola and his stage performance, presence and vocal abilities in the second heat. He managed to lift his song - which is nice but ordinary - onto a new level and should be in the final on talent alone. Another good voice and a catchy chorus, but the rest of the song is an outright mess. It would take a lot to make it work like clockwork on stage, unfortunately quite a lot more than Jasmin Michaela has to offer. Dennis is a pleasant performer, squeaky clean and soft as baby soap. He would have needed a song with more attitude that would let him express some kind of gravity and stage presence. This package is just light, inoffensive and forgettable. Few things are as tedious as a long joke with no punchline. Possibly a song with a promising build-up and good ideas and then never comes to any sort of climax. This is exactly that kind of song. The band themselves are pretty interesting and way better than their song, but what good does that do? Still a laid-back and overall pretty adorable song - perhaps the best one in the running this year - but the vocal performance in the second semi was surprisingly strained and didn't match the otherwise breezy atmosphere. Affected by nerves? Surely it wasn't meant to be like that? If you have an energetic pop number you can usually afford the odd sick note, but the performance last week was a real disaster from a visual point of view. Clarissa and Josh were standing too far apart, almost never allowing the camera to catch them at the same time. Performing in front of tv cameras is a hard job - Clarissa and Josh would need to start over, re-do everything and work with somebody who could fill them in on how to design a stage show with the viewers in mind. There is a serious risk that two guys I like and who would deserve some more exposure are the ones that leave the competition tonight: Lauri Mikkola and Dennis Fagerström. Neither one has a song that would be likely to do particularly well in Copenhagen, but they are both talented and I wish them the opportunity of performing in front of the larger audience that the UMK final brings. If I would have my way, then MadCraft and MIAU are the ones to leave. MadCraft have an energetic song but doesn't have anything to make them unique or original. MIAU has a lot to make them original but their song is perhaps the weakest of all eight in this heat. The final is broadcast on Yle TV2 at 20:00 CET, live stream offered at the official UMK website. Maybe this is an indication of just how little has really happened so far this season, but when the draw was executed to determine what countries sing in which semi final there was quite a bit of a buzz among fans on social media. The final running order will be sequenced by the Danish producers once all entries have been selected, and until we have heard the songs or seen the actual starting positions there is not much point trying to make any more advanced predictions out of this. I am happy Finland is in the second semi final for the second year running, after being drawn in the first semi every single occasion in the years 2008-2012. My heart is already bleeding for the five poor countries that will rejected in the second semi. If only five songs are thrown out and you are one of them - in a year when it would be relatively easy to qualify - means Europe tells you quite clearly that you are rubbish. Not very amusing to face your local press after that. Just to see what happens. Would these arguably bad starting positions stop these powerhouses from qualifying? 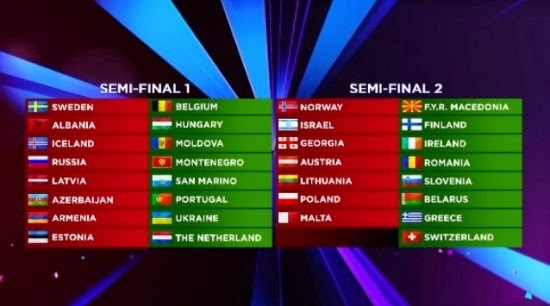 The second heat will do the same as the first one did: showcase six potential eurovision entries, kick one out of the running, send one straight to the final, and let the rest continue as if nothing had happened. Yle had some bad luck in the first heat with the sound mix being weak throughout most songs and I am hoping that issue will be fixed for tonight. It wouldn't really help future editions of UMK if the participants fear that the competition will make them look tuneless on live television. When I first had a fragment of this chorus, I thought this could be one of the entries to look out for. Having heard the whole song, I am not so sure anymore. This mix of a Hanna Pakarinen-chorus, energetic rap and ska is more confusing than effective, and when the 80's heavy metal guitar solo these three minutes already start feeling very long. A quality performer with a quality song in a genre we haven't really heard that often before in Finnish finals. Possibly the negative mindset of the lyrics can scare off a number of viewers who think Eurovision should be a happy party, but surely a contender. Here it comes: the only typical happy eurovision song in the entire line-up, given a very bouncy and charming performance by pop starlet Clarissa in duet with equally likeable Josh. Just a shame that the song is so generic and predictable and made by the numbers. I would have loved seeing what Clarissa and Josh could be capable of had they had more to work with. If you want to know what contemporary Finnish pop music aimed at a slightly older audience sounds like, then this is the song for you. A delicate, almost whispering, little song in a soft and attractive arrangement. Something for the local radio stations to play until the world comes to an end. Perhaps not instant enough for the ESC, but my personal favourite of the year. Together with Lili Lambert - eliminated last week - this is the biggest question mark of the line-up in my book. Both genres were represented last year without any notable success and yet they are back again. This is quite catchy and well sung by a bunch of guys who probably loved Green Day in the mid 90's and kept on playing together since. Not bad but doesn't fill a void in any way. Love. Peace. Trust. Eternal topics of eurovision lyrics. Hope too. Not a bad song, interesting in its own little way, well sung, but the very naïve and straight-forward lyrics become a little too much for me to swallow in the end. So, who will be tonight's direct qualifier? It is harder than ever to predict, since Yle introduced a little novelty in the voting this year. If you have money in the bank and wish to help your favourite in a big way, you can buy blocks of up to fifty votes in one go. There could be some good reason for this new function - surely there is one - but it also leaves a bitter taste after the show. Last week's direct qualifier Softengine were clearly the best act in the running but is also the only act to be picked up by a major label. The tiny suspicion that their label could have made a little investment in getting their group into the final keeps nagging at the back of my head. The question for UMK is not only who has the most appealing entry but also who could have fans willing to cough up some money for their favourite singer. All that aside: I think tonight's qualifier will be Clarissa - given her energy, star quality and her fan base among the Swedish speaking parts of Finland; a group that has had a certain impact on the results during these last years. In the other end of the result, I think rap-ska-combo Makea will have a hard time breaking through to the audiences, possibly battling it out with MadCraft or Hanna Sky unless the latter really impresses with her vocal skills. There should be a live webcast available worldwide on the official UMK website. Switzerland is another one of those countries who often bring out their little song into the Eurovision spotlight and you never know what the audience will make of it. Complete hit or miss. Sometimes pointless Swiss entries get loads of points (although it has been a while since this happened last) and sometimes brilliant little songs get completely overlooked for no apparent reason. And this is where I want to hold up Piera Martell and cry for justice. What were the juries really thinking back in 1974? According to her Eurovision biography, former construction worker Piera admired singers like Streisand and Minnelli and wanted to bring a flavour of that into the contest. I think her attempt comes pretty close. Her song is admittedly a very classical schlager ballad that must have felt a bit old-school already back in Brighton, but what does it matter when it is as well crafted as this one? A delicious intro turns into a short verse that builds up to the big chorus and an even bigger finish, following a very fine key change. All presented in a classy green dress and a sense of drama in the delivery. Three points was all it was worth according to the juries. Shared last place. Unbelievable. In spite of this miscalculation, Piera had quite a good career in Switzerland throughout the 70's and even participated in the 1976 German pre-selection before retiring from the industry in 1981. Being in a rush has never been a typical Finnish trait. When most other countries use semi finals in order to quickly reduce the number of songs in the running, this first heat of UMK will content itself with singling out one finalist, kick one other song out of the competition and subsequently let everyone else continue to the second chance heat. At least it allows more exposure of most participants, and that is what the UMK set out to do: expose new songs and Finnish talent. So what about the songs, then? I wrote about the general standard already yesterday - now it is time to take on the individual songs of the first heat. The grades are based on the studio versions as well as the demo performances shown on earlier UMK shows. Female trio with an attitude and a song that presents a lot of good ideas that unfortunately never really take off in any big way. The chorus goes on and on without any climax in sight. Had the songwriting been a bit sharper, this could have been a contender. A very polite, clean-cut and easygoing little pop ditty, as light as a summer breeze, unlikely to disturb anyone. Which is a minus in a competition where people are supposed to vote for you by phone and where you need to stand out and be remembered. Lucky break that Dennis himself is such an asset - likeable and lively - but the question is if that is enough. I would like to like this more than I do. A competent piece of disco, well sung and with a retainable chorus. But also generic and very much heard and done before. It would take an almost supernatural amount on stage presence to make this seem like a Eurovision winner in 2014. This duo does look a bit odd at first, but they also bring the most personable entry so far and that is not a bad thing. Most probably this will go nowhere near a victory, but it is pleasant and catchy in its own little way. Another slightly generic-sounding song - The Lovebugs? Sinplus? Petr Elfimov? - that is completely saved by a convincing performance. A young band with good voice and a strong presence and - not least important - a major record label behind them. It would be a small surprise if this entry didn't go on straight to the final tonight. A good voice and a catchy chorus meets a complicated and messy verse, and again you ask yourself why nobody tried to clean up the songwriting a bit. If they get this to work on stage it could be a dark horse, otherwise it will fall flat. What do I predict, then? Yle didn't make it easy for themselves since they allowed people to buy block of votes (up to 50 votes per voter) in the internet voting. Suddenly they will have to fight off allegations of vote rigging on a completely new scale. Suddenly qualification seems to depend even more on fan base and financial muscles than ever before. Which makes prediction hard. I think Softengine will go straight into the final. Hopefully because the audience wants them, hopefully not because their brand new record label decides to push their career. And who falls out, then? It can be anyone of the others, really. I think it could be Lili Lambert that falls out, and keep my fingers crossed that it will not be likeable Dennis Fagerström. 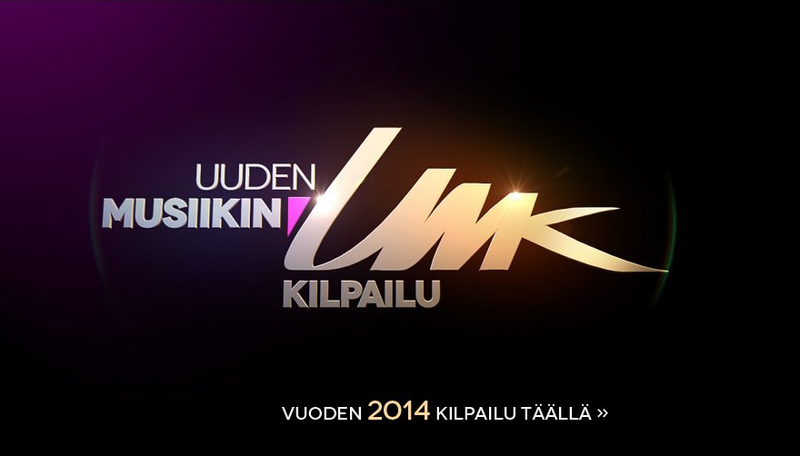 Live webcast should be available from Yle's official UMK page. Belarus just held their national final for Copenhagen, and keen Eurovision fans know what that means. Exactly, it means nothing. Nothing what-so-ever. More often than not, the winning song gets replaced some time after the final anyway. If the winning performer is really unlucky, he or she will soon be history as well. Anyone can be replaced and is likely to be. But if we play with the idea of Belarus actually sending their national final winner off to the ESC? If this would happen, my first reaction is positive. "Cheesecake" is a wacko title. Seriously wacko. The lyrics are… creative. But the song in itself is quite catchy. A little bit original. And TEO is likeable. In the unlikely event of this being present in Copenhagen, it would be my favourite Belarusian entry in a long time. Not that it takes a lot, but still. After three warm-up shows where the 12 contenders have been presented to the audience, Finland will finally start eliminating songs in order to make a final shortlist of eight hopefuls. This is the third edition of the UMK selection modus, and despite failing to make Finnish fans over-enthusiastic it has still been an ambitious attempt to make a long-needed reboot of the national final. I've been a slow starter this season, but finally got around to listening to the entries and watching the demo performances shown on Yle and I find myself wondering what the purpose of this contest really is. If the purpose is to showcase new Finnish talent, it is doing quite well. There are few opportunities for unsigned Finnish talent to sing for a larger audience - let alone on television - and many of these songs sound like they could have a future in the local charts. If the purpose is to find a successful Eurovision entry, I'm more puzzled. None of these candidates sound like given qualifiers in Copenhagen. They are all nice, well produced and in many cases enjoyable. They are just not the type of songs that get showered in points when international televoters get to have their say. My objection is - as many times before - that the songwriting is too generic and too unsurprising. I'd like to tell a few of these people that choruses are not bad for you. Hooks are your friend. Being catchy is not a sin. In the 1974 German internal selection, the broadcaster listened to the songs proposed by the selected singers, then told them none of the songs was good enough and asked them to produce new ones. Had I been in charge of UMK I would have been tempted to tell a few of these singers something similar. Many of them are promising talents, some of them have promising songs. But unless some of these songs start growing and growing, it will be hard for anyone of these to make any bigger impression come May. Unfortunately.